I like eating my meals with knife and fork as much as the next person. And apart from the occasional bite of leftovers in front of the open fridge or piece of fruit slurped down over the sink, that’s how I normally do eat: table, chair, plate, silverware. It’s a time-honored formula for meal consumption that keeps our fingers and clothing clean and provides a framework for both polite socialization and the daily reinforcement of family bonds. Nevertheless, it’s not by any means the only way to eat, nor is it always the most fun. If it was, why else would street food be so perennially popular? Street food is inarguably one of humanity’s great common denominators. From the fish and chips of Scotland to the fish tacos of Baja, it’s made – and eaten – by everyone. Of course the specifics may vary; in some places, such as much of Asia, a huge variety of food is prepared and eaten directly on the street, sold from mobile carts and makeshift kitchens that may be here today and gone tomorrow. Elsewhere permanent structures house the operations, offering a nearly restaurant-like experience except that you’re expected to clear out and enjoy your meal somewhere else. The types of street food on offer varies too – in some countries the sheer variety surpasses that of restaurants and home kitchens, while in others only a limited repertoire of foods is deemed worthy of munching on the go. But whether it’s meat or vegetables, salty or sweet, messy or clean, hygienic or not, one characteristic seems to unite street food everywhere: it’s nearly always remarkably good. I have various theories about why street food seems so much more reliably tasty than, say, restaurant food. One has to do with the ‘fresh air makes things taste better’ factor. You’ve probably experienced how a meal eaten while camping or picnicking, even if it’s the same thing you’ve eaten day in and day out for years, tastes ten times better in the great outdoors. The only weakness to this theory is that an exhaust- and traffic-choked street – the scene of many a great street food experience for me – is hardly the great outdoors, and somehow the food is always just as good. Another theory, then, is what I like to call Culinary Darwinism. It goes like this: in the street food business, without the fallbacks of great service or atmosphere to lure in paying customers, the food is everything, and since bad food unequivocally spells economic failure, in the grand scheme of things there must be a lower proportion of bad street food than bad restaurant food. Makes sense, no? Of course there are other things at work here too, like the universally low cost of street foods – I, for one, find it much easier to appreciate subtle nuances in flavor if I’m not preoccupied with feeling ripped off. Then again, I’m kind of partial to the notion that street food is so tasty because so much of it is fried. Frying seems to be the ideal way to make food portable – it seals in messy fillings, it’s quick and requires minimal equipment, and it can be done à la minute. And did I mention that everything tastes better fried? Certainly chickpeas do, or as I should more rightly say, chickpea flour does, as the Levantines have proved with falafel, the Indians with pakoras, and the Sicilians with their crunchy-soft, light-yet-toothsome snack called panelle. Panelle are the southern siblings of a street snack called panisses in southern France, and are made by cooking chickpea flour and water into a stiff paste before plunging strips of it in oil until they sputter, puff, and turn a nutty golden brown. In Sicily they often layer the freshly-fried panelle between slices of bread to create a delicious, economical sandwich; in Nice they sprinkle them with sugar just as often as with salt. And while the chickpeas alone lend a full, hearty flavor to these fritters, I also like to think of them as a blank canvas. Here I’ve added rosemary for a delicious woodsy fragrance, but I imagine you could be as creative as you want with these, experimenting with all kinds of nontraditional herbs and spices. The only thing that’s obligatory is to serve them hot and crisp, straight from the fryer. Knives, forks and plates – not to mention a roof – are of course entirely optional. Oil two large baking sheets and set them aside. In a medium heavy saucepan, whisk together the chickpea flour, water, salt, and rosemary until completely smooth. Place over medium heat and cook, stirring constantly with a wooden spoon, until the mixture thickens to the consistency of polenta or a thick porridge, about 10-15 minutes. Remove from the heat and whisk vigorously to get rid of any lumps, then quickly pour the mixture onto the baking sheets, dividing evenly. Working quickly, spread the mixture out, smoothing the top as best you can, to a uniform thickness of 1/8-1/4 inch (4-6mm). Let cool completely. Using a sharp knife, cut the firm chickpea mixture into triangles or rectangles 2-3 inches (5-7cm) long. Heat 3/4 inch (2cm) oil in a deep, heavy skillet until it registers 375F/190C on thermometer, then fry the panelle in batches, turning occasionally, until golden and slightly puffed, 3 to 5 minutes per batch. Transfer to paper towels to drain. You can keep them warm on a baking sheet in the oven while frying the remaining batches. Just before serving, sprinkle with lemon juice and pepper. Serve immediately. Those look divine. I’ve been impressed with my limited experiments with chickpea flour. It works well as a background for Indian flavors as well (not surprisingly, considering it’s so easy to find in Indian shops and is a traditional ingredient). I’ve been making curried chickpea flour pancakes, which get some pan-fried crispness, but of course aren’t quite the same as deep-fried. I’ll have to give these a try. These looks spectacular! You missed one tasty chickpea flour concoction, though: The Provencal socca. Yum. I will definitely be trying your recipe out, and will add it to next week’s Gluten-Free Recipe Roundup on my blog. i have some chickpea flour that’s been sitting around my pantry for a while. this will be a perfect use! thanks for the recipe. your food and pictures are beautiful as usual! In the eastern parts of India, namely in West Bengal soaked chana/gram/chickpeas are ground and cooked in a similar manner. The cooked paste is flavoured with different spices,depending on the cook and after the process you described, the deep fried squares are further used to make a curry. The fried squares are called "dhoka" which means fraud. I don’t really know why there are so called but this dish is usually a well known subsitute for meat dishes on certain occassions. these looks fantastic. never thought about using chickpea flour. i wonder if you could do something similar with polenta? Oh yeah, I want some of these guys.Yum. You are on to several somethings with the street food theories. I do think the fried thing is a biggie. Fried stuff is just so good. And you can walk away from the vendor and the hot fat, conveniently forgetting about the mess, health issues (sssh) and the smell that sinks into your clothes and home if you make fried stuff yourself.And street food must be vivid, to catch your attention, with all the distractions of the urban panorama. It’s exciting stuff- and we should have it when we can, in case it will not be there on the way back! I love street food! After grocery stores, eating on the street is my favorite way of learning about a culture’s food habits. I’ve been surfing around a lot of blogs these past 2 days and this is, in my opinion, one of the most interesting recipes. Thanks for sharing! OMG! I’m so going to make this. Cheers! Mary – Chickpea flour pancakes a favorite of mine too. There’s a recipe in Madhur Jaffrey’s ‘Flavours of India’ that I used to make all the time – it’s flavored with red onion, ajwain seeds, fresh chilies and cilantro. So good!GFBTB – Socca (and farinata, the Ligurian version) is heavenly, isn’t it? I had a fabulous seafood version which I tried to recreate a couple of years ago (it’s in the recipe index if you’re interested). I don’t think I’ve ever had something made with chickpea flour that I didn’t like.Yoony – Thank you!Anyesha – I’ve never heard of dhoka, but it sounds absolutely delicious. You don’t by any chance have a recipe to share, do you? I’ve read about the many Western Indian/Gujarati preparations that use chickpea flour to make cakes, noodles, etc, but I’ve always been too intimidated to attempt any of them myself! Kat & Jules – Thanks :)Andreea – As a matter of fact you can! You basically follow the same steps only using cornmeal instead of chickpea flour – cook it, cool it, cut it into pieces and deep-fry (or pan-fry, but it won’t get quite as crispy). They’re typically served either with a tomato sauce or au naturel.Lindy – I hear you about the smell. I have absolutely no fear of boiling oil nor do I let the questionable health aspects of fried foods bother me much, but I deep-fry rarely simply because it takes three or four days for the house to stop smelling like a fast food restaurant. Better leave it to someone else! I can get everything from haggis to Mars bars in my neck of the woods but unfortunately I haven’t found anyone that does panelle… Tulin – Perhaps it’s possible to grind your own? I’ve never tried, but I imagine if you soaked the chickpeas overnight it should be possible, though you might not get as fine a result as with the flour. Lisa – Ditto, and ditto. Have I mentioned how much I love supermarkets? I mean, markets are great and so atmospheric, but supermarkets offer a kind of cultural voyeurism you just can’t get anywhere else!Phil & Catherine – Thank you both, and don’t forget to report back if you give these a whirl! Panelle makes my mouth water! Nice photo! Dear Melissa, A lovely site – the title is awesome. It was only the other day that I had invited someone home for a meal and was wondering the same thing – do we all not relish eating with our hands as much as we enjoy using the fork and knife? Interesting writing! The food from the roadside is probably the thing that gives us all the youthful feeling and the feeling of abandon. The fork, knife and roof can wait while we freak out!!! Agree with you that fried food is a lot tastier and fills in much more, more easily. Rosemary Panelle sounds great. Going to try it out! I have a mostly-neglected bag of besan flour in my pantry. I’ve only used it for pakora but panelle looks so easy (I’m lazy!) that I might have to give this recipe a whirl tonight!Thanks! Ooooh!!! You can’t imagine how much I miss those panne panelle! For me they means such a wonderfull time 5 years ago. I spent 5 weeks in Sicily because of an ugly breakup and university crach. When I came back, (with 5 kilos more panelle, pasta, gelati…) I was another woman. I discover my passion there and I turn it into my job. Now I’m a young architecte and I love to cook (I used to hate it before…). Sorry for beeing so intimate in just one post, but… (and sorry for my english). Thank you for these recipe! I made these tonight and we all loved them. I left out the rosemary (cuz, in my house, it’s not kid-friendly, unfortunately) and added parmesan cheese, which I couldn’t really taste. I might try a stronger cheese next time.Thanks for posting this. They are so delicious! 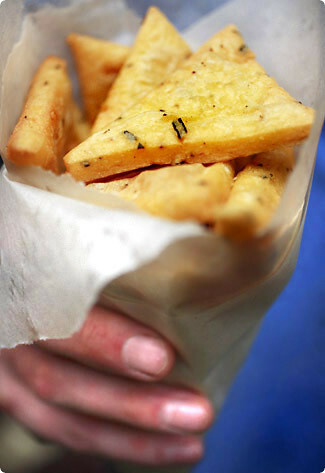 Hi there,I made these with thyme, they were delicious, thanks for the recipe. I also made a dip to go with them from Greek yogurt, fresh garlic, lemon juice and salt. Thanks again for the inspiration! I had panelle for the first time last year while in Palermo. I love them. Most vendors keep it simple and add nothing more than a touch of parsley to the mix. I had them again just a week ago while on vacation in Sicily and found one vendor who used parsley and some minced garlic! They were divine. He told me that true panelle don’t use garlic, but said garlic makes the mouth happy. He also said that it is a must to serve them on soft sesame buns with salt, pepper and a squirt of lemon. I just found your recipe on pinterest and love it. I was searching for chicpea recipes as I am doing a special nutrition program and I never cooked with chickpeas before. So I definitely have to try this one, it looks amazing!! !